Above all, keep your dog hydrated. 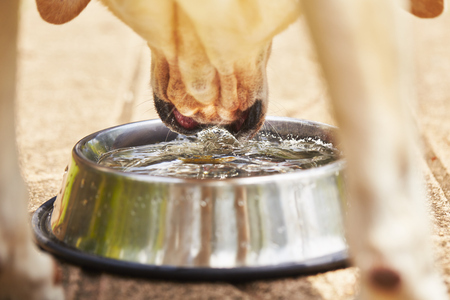 This may seem pretty obvious but pets go through water quicker in the summer so you have to keep an eye on the water level in the bowl at all times and refill when needed. If it’s a really hot day, perhaps add ice cubes to the bowl. If your dog loves eating more than anything else, feed them treats that are cool and high in water content. You can find dog ice cream in pretty much every grocery store or you can make your own dog ice cream. Clipping double-coated dogs won’t actually help keep them cool because the top hairs act as insulation against heat and sunburn, but keeping your dog properly groomed will. The undercoat acts as part of your dog’s natural cooling system but if it’s not properly maintained, it can become matted and prevent air flow. Brush your dog to help remove any dead fur and keep your pets coat comfortable and healthy this summer. Often time’s dogs lay down on cold tile to help them cool down, so if you usually let your dog sleep with you in your bedroom at night, perhaps try letting them sleep in the kitchen instead to ensure a cool and comfortable nights rest. If you don’t have cool flooring, you can still apply this principal by soaking a towel in cold water and letting your die lie on that instead. This will make a huge difference and your dog will thank you! While you’re sipping on sweet tea on the front porch this summer, make sure you don’t forget your pet’s needs! If you’re interested in adding a new pup to your family, give us a call at 804-798-7877 or stop in and see us on Washington Highway in Ashland, Virginia today!